If you like modern Metal, then your favourite bands and guitar players are probably using many "wrong" notes in their riffs. Somehow they are always able to make these "wrong" notes sound "right"... but when YOU try to do the same, the results are much less satisfying. When I was trying to learn this for myself, I had a friend guitar player who was great at composing this kind of licks... but the best advice he could give me was "I dunno... I just hear them." As it turns out, my friend wasn't too far off the mark, but of course I have something that is going to be much more helpful to you than what my friend told me. By using this trick you will "educate" you ears so that in future you will invent by yourself more creative ways to play outside of the scale! What are you waiting for? 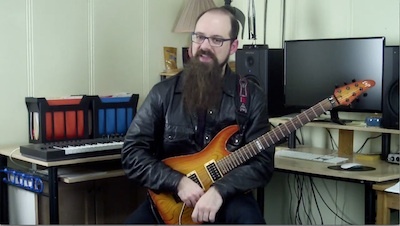 Watch this video on how to play "outside" notes in Metal guitar so that you too will be able to create crash "atonal" riffs that sound amazing!